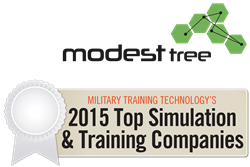 Canadian Software firm, Modest Tree, has been recognized for their contributions to the military simulation and training industry and is listed as one of the top 100 simulation and training companies for 2015 by Military Technology Magazine. Modest Tree, a Canadian simulation and training company, announced today that it has been recognized as one of Military Training Technology (MT2) Magazine’s Top 100 Simulation and Training Companies. Each year companies worldwide are evaluated by MT2’s editorial staff and a panel of industry experts to determine the top companies who have made significant contributions to the military and training community on the basis of innovation, military solutions provided, total military sales and overall program effectiveness. “At Modest Tree our ambition is to enhance training technologies to simplify the creation of 3D game-based training and to provide our clients with customized game-based training solutions. We are honored to be recognized as one of the top simulation and training companies,” said Sam Sannandeji, CEO of Modest Tree. The listing of featured companies will be published in the Military Training and Technology (MT2) Magazine’s September 2015 Issue (20.5). MT2 is America’s longest established and leading magazine for news and expert discussion about all aspects of military training and simulation. Modest Tree is an innovator in 3D interactive training software and customized training solutions. Modest Tree leverages our team’s experience delivering aerospace and defense training solutions and gaming technology applications to bring clients cost effective, next generation 3D training technologies. Our mission is to simplify the creation of 3D game-based training applications.